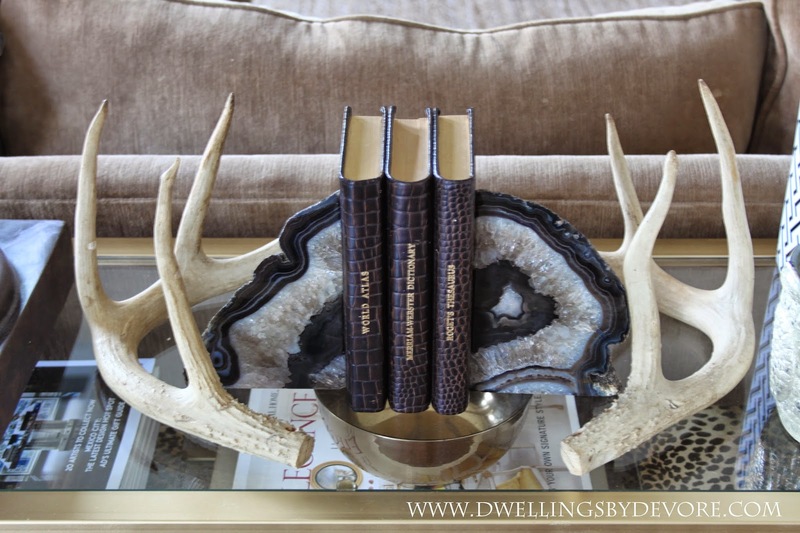 Today I'm sharing a little bit of my fall decor as part of the Blogger Stylin' Home Tours hosted by Lindsay at The White Buffalo Styling Co. It has been so fun to follow along and see all the beautiful fall decor everyone has come up with. If you are coming over from Julia's blog, Cuckoo 4 Design, welcome! I'm so glad you are here. 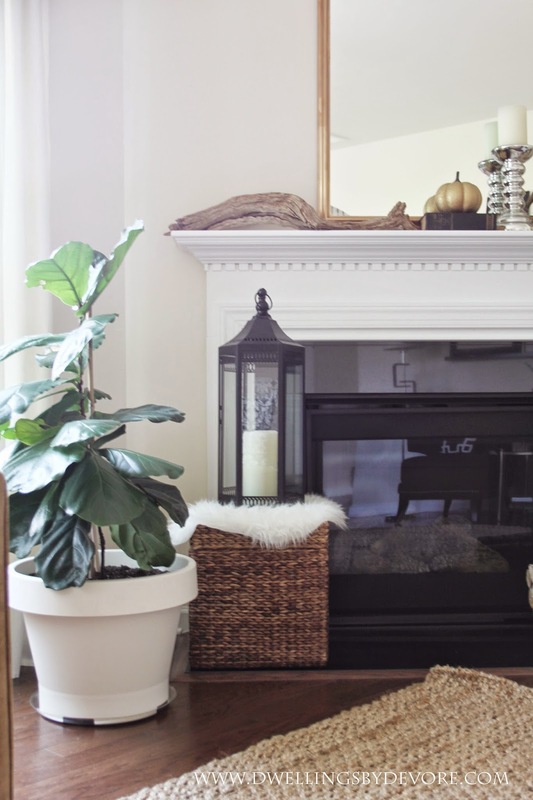 I haven't had a chance to do a ton of fall decorating this year because we are still settling into our new home, but I did want to add a few fall touches. Fall is definitely my favorite season of the year. I grew up in Florida where we didn't really get to experience the seasons so that is one of my favorite things about where we live now. The cool air, rocking on the front porch, pumpkin everything, I love it all! 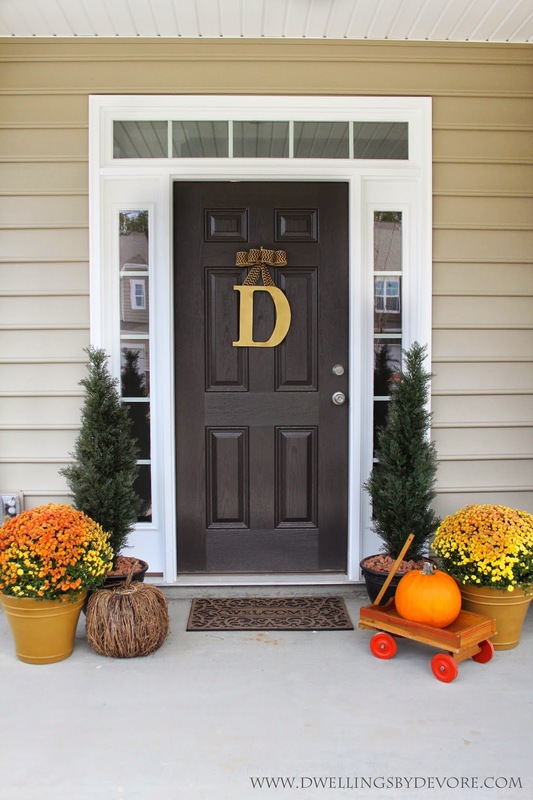 Speaking of front porches, I decorated ours with mostly traditional fall elements this year. These huge mums were on sale on Home Depot for $6! 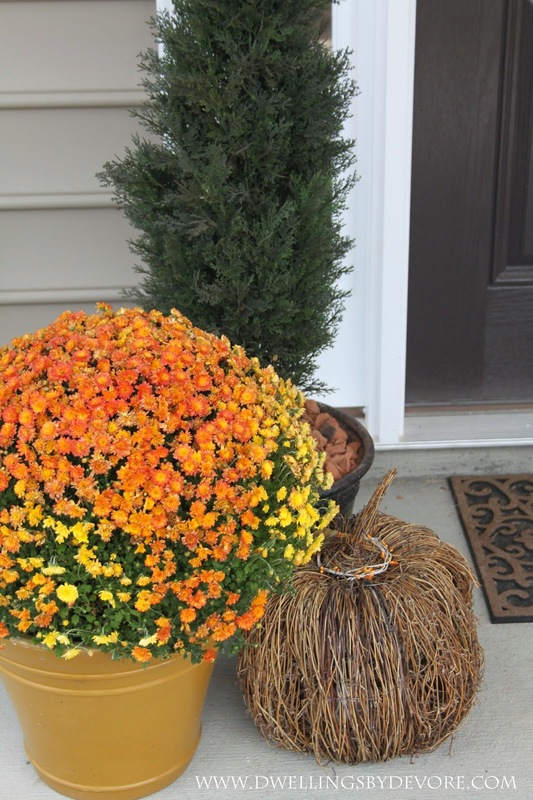 I couldn't pass up that deal and they really help bring the fall feeling to our front porch. 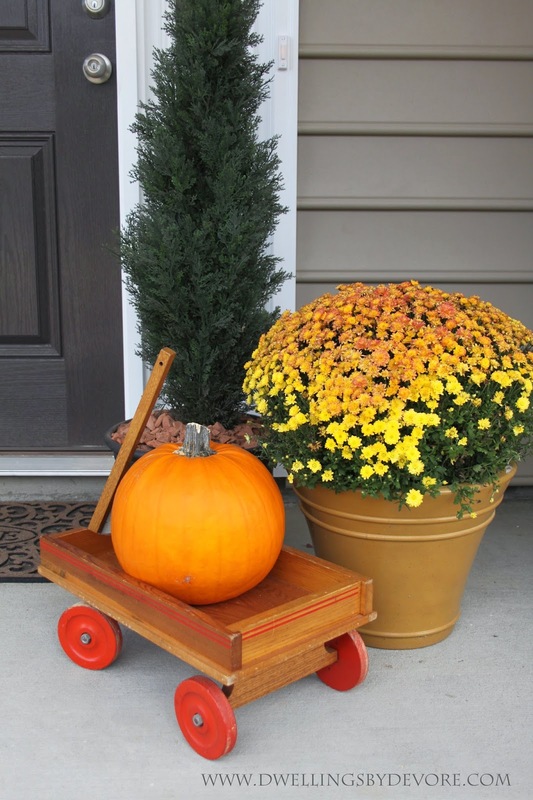 My husband's childhood wagon makes the perfect perch for our pumpkin. And my two year old thinks it's so fun to wheel it around the porch. Simple decor and free entertainment in one, it's a win win! 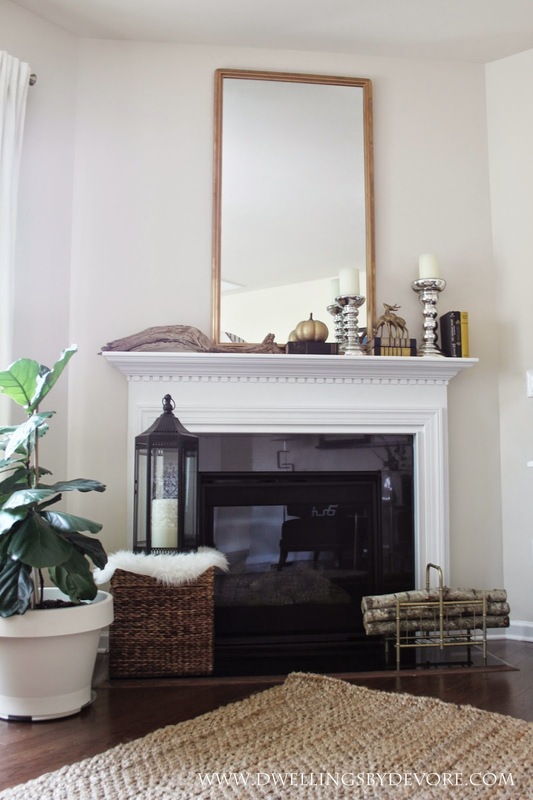 For the inside of our home, I chose to keep things really simple with an earthy vibe. 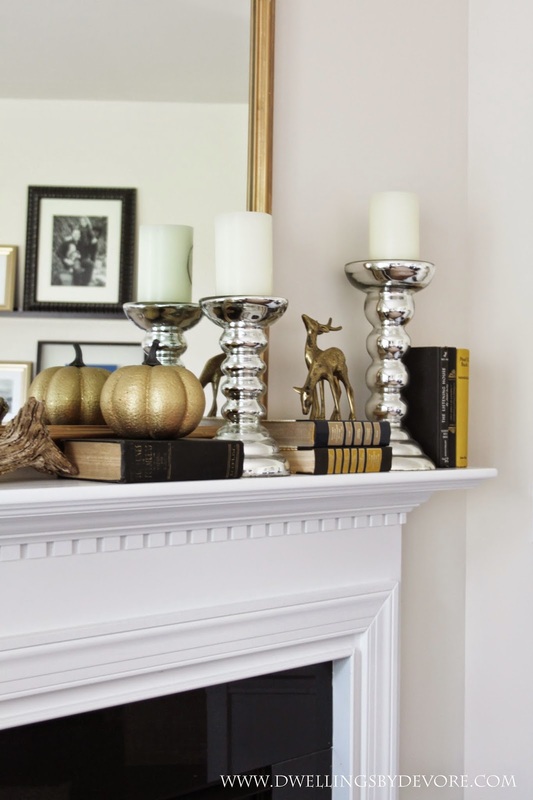 I'm really drawn to earthy elements anyways, so I love incorporating them during the holidays too. 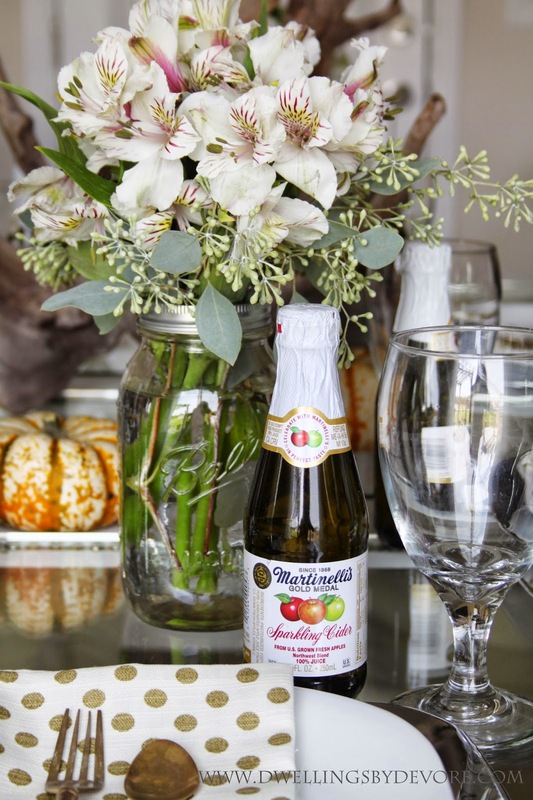 My mom found these cute little mini sparkling apple cider bottles at the dollar store so I thought it would be fun to include them in this fall-ish table setting. I always find it hard to resist the flowers at Trader Joe's. They are so reasonably priced and always add such a nice, fresh touch. Moving into our living room, I changed up our newly revamped sofa table a little bit to make it feel a little more like fall. My husband rarely gives any input on the home decor front, it's just not his thing, but this house has sparked something within him. So as I was decorating this little area he told me to wait because he had an idea. He ran into the other room and grabbed this cowhide remnant I've been hanging onto and placed it right on top of the trunk. I actually really liked the texture and warmth it brought in. Before I know it he'll be taking over this blog! Our fiddle leaf fig survived the move, despite having it's leaves hanging out the windows of my in laws car. It was the only way we could fit it in there and I just knew it wasn't going to make it. Somehow it pulled through and I'm so glad! I kept our mantle pretty simple too, with a small spray painted foam pumpkin, some brass deer, and a few books from my thrifting stash. Thanks again for taking a peek at our fall decor! Be sure to check out more of the tours tomorrow, starting with Rhoda from Southern Hospitality! If you want to see more of my projects, be sure to check out the projects page or tour our last house here! WOW! your dining room looks amazing already!!!! LOVE it! you are fast! Every time I look at your house now, I want to buy a new home. I love everything and it is so you! Ha ha, how funny that your husband is getting into the action! I love your natural table! I can't believe how quickly you're pulling things together in your new home! It looks beautiful!!! 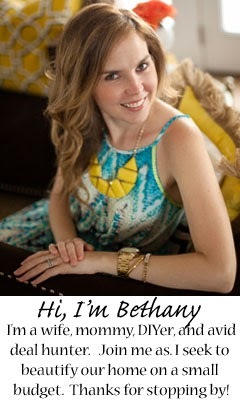 Love, love, love your gorgeous earthy style, Bethany! Love your tour Bethany and getting to see the new digs! I love the earthy tones! You've done such a beautiful job my friend. Love it all. I love how you combine gitz and nature for such inviting spaces. Thanks so much Kristin! It's one of my favorite things too! Thanks so much Marty, that's such a sweet compliment! 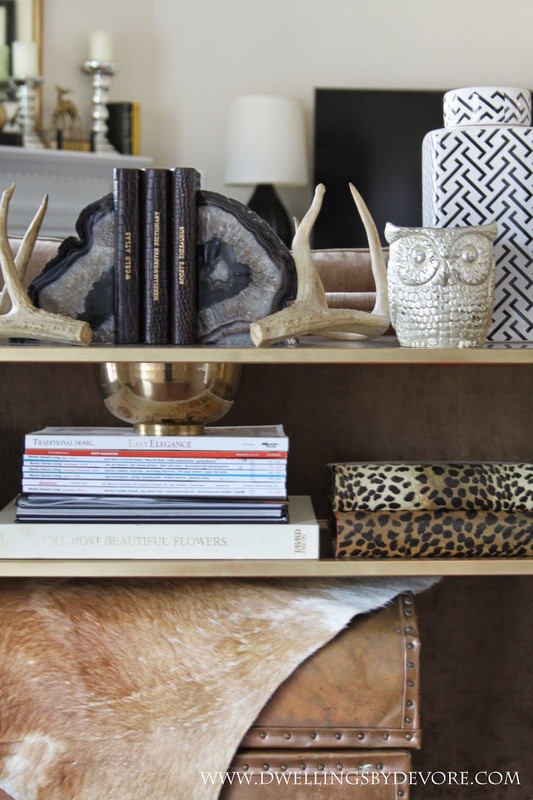 Glitz and nature are two of my favorite things and I always want my home to feel inviting. Thank you so much! I'm so glad to be a part of this series again, thank you for putting it all together! Thank you Laurie! Slowly but surely we are getting there! The rest of my home is a mess, but I'm happy that these two rooms are pretty much done. Thank you so much Julia! I'm really enjoying decorating a blank canvas and really trying to make it my own. Thank you so much Cassie! I knew I had this tour coming up so I had to get going on it! The rest of the house is pretty much a mess! Everything is gorgeous Bethany! Especially love your Dining Room! 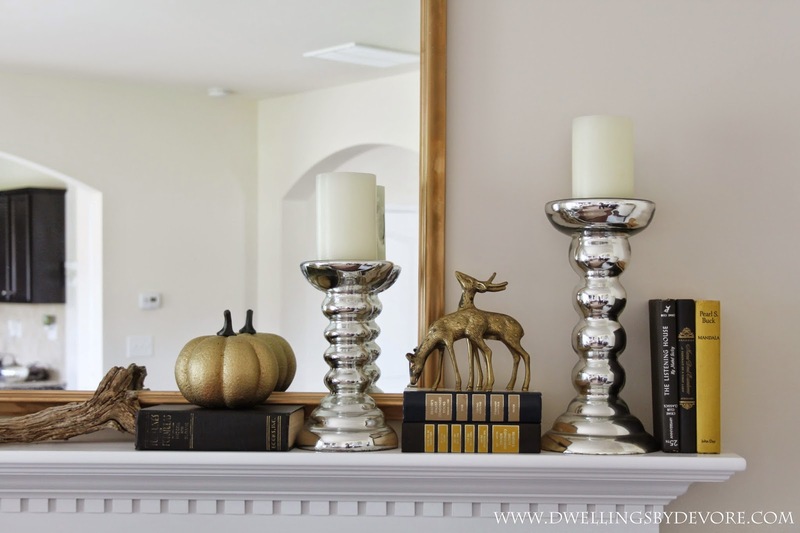 You have done an amazing job decorating for Fall - I would never guess you just moved in! 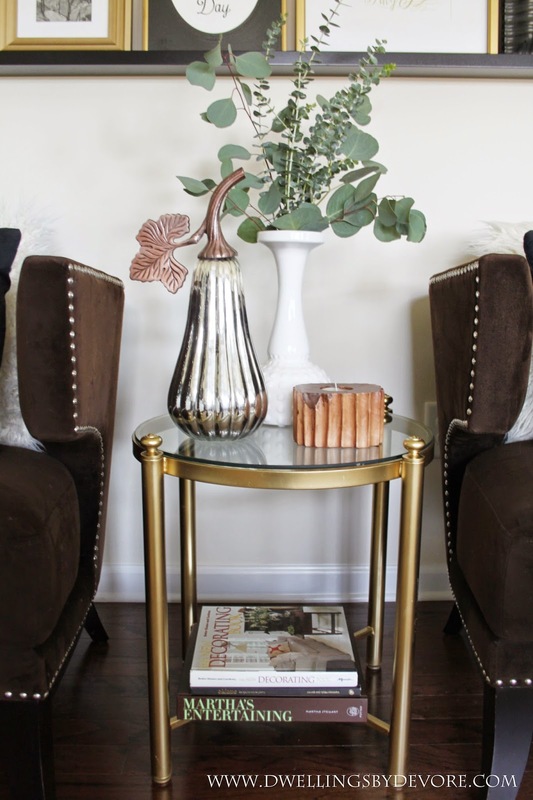 I love how you've styled the sofa table - gorgeous! So gorgeous Bethany! It is looking fabulous in your new home! Love the little detail about your husband helping out - I have to admit, the cowhide looks awesome there. I'm the same way with Trader Joe's - can never pass up the flowers! 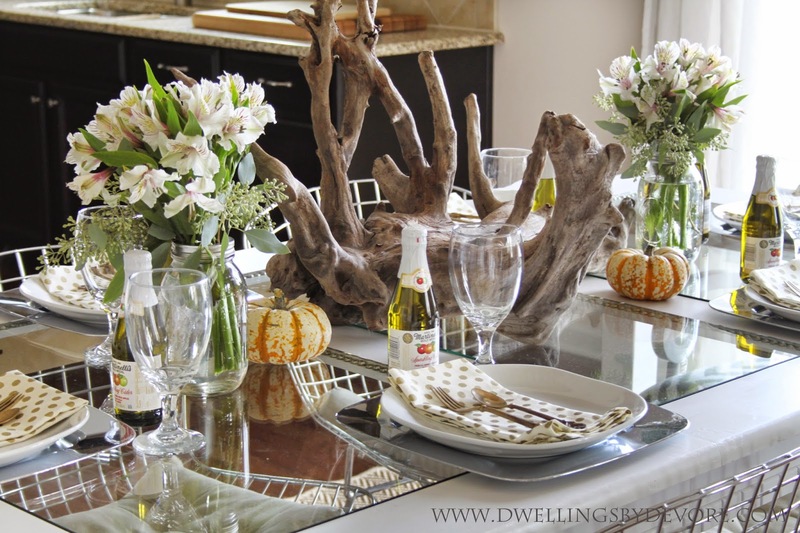 I love that sculptural driftwood centerpiece on your table. And so funny that your husband has design input! 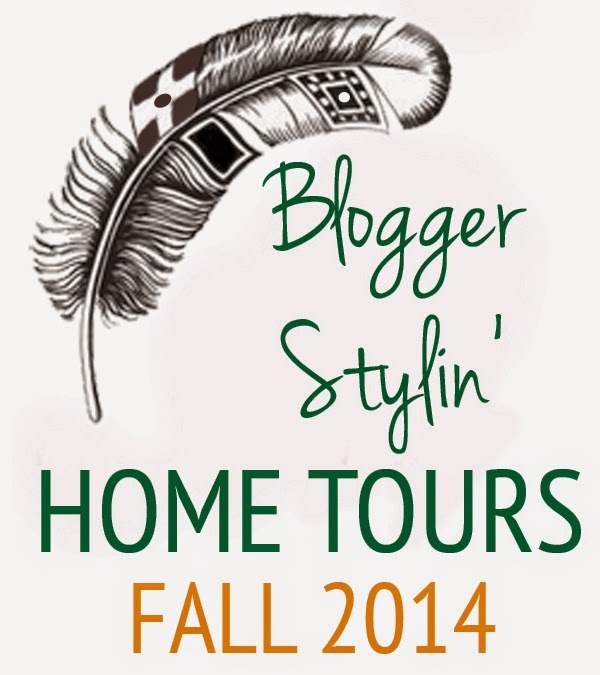 My husband's usually consists of, "Stop buying pillows" :) Beautiful tour, Bethany! Love seeing your new home!! 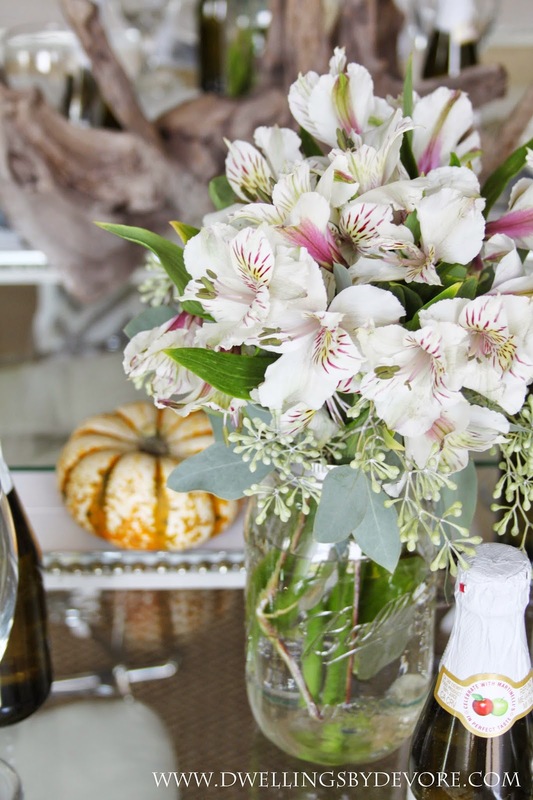 Love all the fall touches! Oh such great styling! 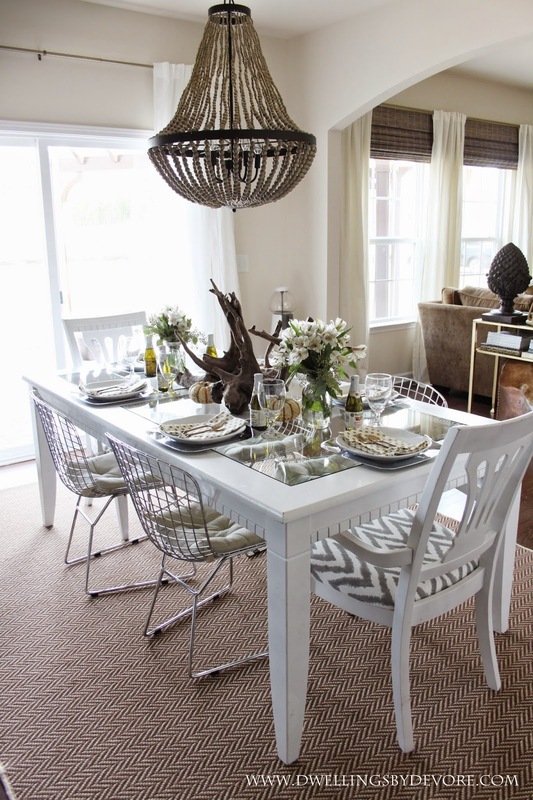 Love your dining room. Beautiful! 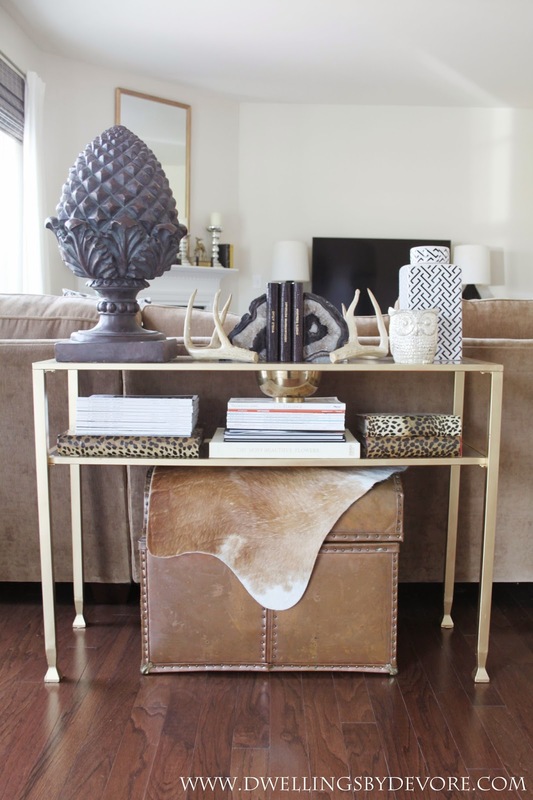 Love the mix of neutrals, textures and metallics. Nice job! Thanks so much! I'm on a neutral kick lately!